Apple’s press conferences are news events. Even here at PopFi we talked about Apple’s upcoming September 9 press conference, and since today’s September 9, all the good news is out there for the perusal of the world. As expected, Apple mostly rolled out newer versions of its staple products, but there were a few surprises, mostly on the accessories front. Apple expects their loyal fans to pay $99 for a stylus to use with their new iPad. The idea amused, shocked, and horrified the Internet, as you’d expect. This from a company whose previous boss, Steve Jobs, routinely mocked the products that used a stylus. Tim Cook is clearly not Steve Jobs. One of the more interesting products is Apple’s $169 Smart Keyboard, which is basically a keyboard for your iPad that makes it into an Apple version of a Microsoft Surface. Knowing someone with a Surface who uses the keyboard all the time, it’s definitely helpful when it comes to being productive on the go, moreso than a touch screen, which can get a little clunky and difficult to manage; it’s just a shame you have to buy a new iPad to use it. The Smart Keyboard and the much-maligned Apple Pencil work with Apple’s new iPad Pro, a gigantic iPad designed for business users that was tested by a team including, gasp, folks from Microsoft! For those interested, the iPad Pro ranges in proce from $799 for the 32 GB Wi-Fi model; $949 for the 128 GB Wi-Fi model; and $1,079 for the 128 GB model with both Wi-Fi and cellular capabilities. Apple also announced a new iPhone 6s and 6s Plus which look just like the old ones that sold so well, but with some internal tweaking. Apple also revamped Apple TV. 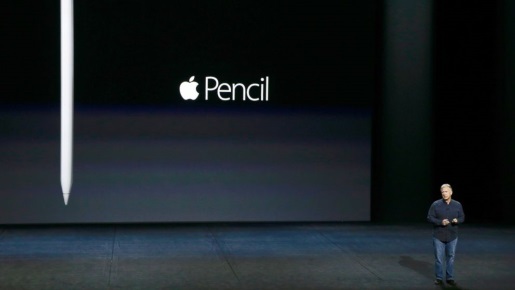 But still, for all the good things they announced, a $100 plastic pencil is not one of them, I don’t care what sort of revolutionary features it supposedly has.